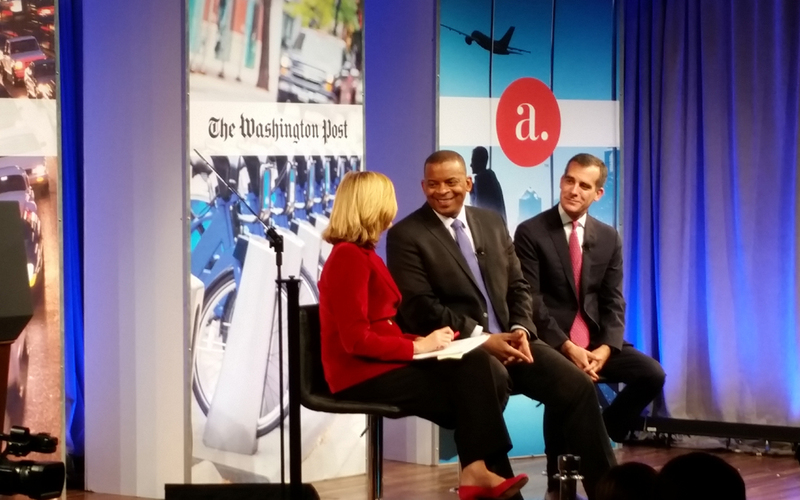 Pictured from left to right: Mary Jordan, editor of Washington Post Live, U.S. Secretary of Transportation Anthony Foxx, and Los Angeles Mayor Eric Garcetti. The “Washington Post” tackled how to “Fix My Commute” at the inaugural America Answers forum held in Washington, D.C., October 21. Panelists took an in-depth look at the future of transportation, how technology will change the daily commute, and the importance of investing in the country’s infrastructure in order to keep the U.S. competitive in the global market. Vice President Joe Biden joined the discussion to emphasize the importance of transportation to the economy, and the value of bipartisan efforts to pass transportation funding legislation. Additionally, Former U.S. Secretary of Transportation Andrew Card said future federal investments should be paid for by system users and embraced the concept of a vehicle-miles-traveled tax. Former Pennsylvania Governor Ed Rendell examined the quality of America’s current infrastructure and called for eliminating the prohibition on tolling existing segments of the interstate system. Current U.S. Secretary of Transportation Anthony Foxx discussed his views on the way to move forward and improve the nation’s roads and bridges by utilizing public-private-partnerships, new developments in technology, and utilizing resources to maximize returns. Mayors Ralph Becker (Salt Lake City), Carlos Gimenez (Miami-Dade County), Kasim Reed (Atlanta), Eric Garcetti (Los Angeles), and Michael Hancock (Denver) spoke about the importance of transportation to their cities, and how they are working to improve their respective transportation systems. Representatives from Tesla Motors, Ford Motor Company, Google and Terrafugia discussed technological developments that will change how society uses cars, while spokespeople from Amtrak, Maglev and the Siemens Corporation reported on the future of mass transit, trains and buses.